Body scan meditation is a quick and easy way to access your relaxation response, an effective counter to stress and your automatic fight or flight response. 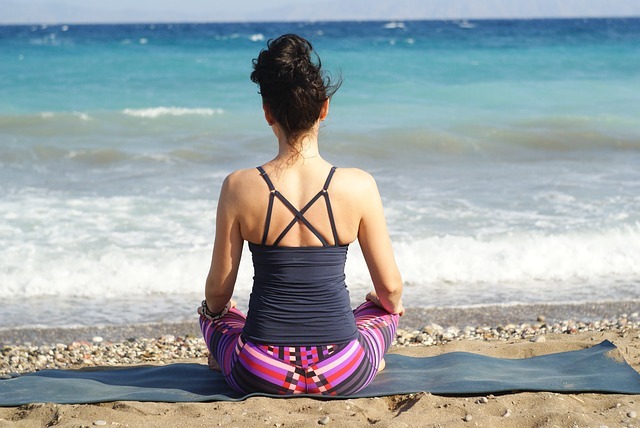 Body scan meditation has the advantage of being flexible – you can use it anywhere at any time. You don’t have to undertake an extended body scan to realise its benefits. Olivier Devroede, author of the Mindfulness Based Happiness blog, explains that body scan in the yoga tradition is used for relaxation, whereas in some mindfulness traditions, the purpose is the development of acceptance. Jon Kabat-Zinn also provides a “bodyscape meditation“, incorporating a body scan, that is designed to enable you to become more aware of your body and its sensations and, through this meditation practice, become grounded in the present more readily. Diana Winston, Director of Education at the Mindful Awareness Research Centre (MARC) offers a brief, 3-minute body scan that can enable you to quickly wind back your disabling response to a stressful situation. It can serve as a regular practice, too, that can progressively build automatic awareness of body sensations and emotional responses. Diana also offers a 13-minute body scan meditation for sleep when you are going to bed. At other times, you might actually be trying to avoid sleeping during meditation. Body scan is something that can be short or extended, incorporated into other forms of meditation and used flexibly for different purposes. While the intention of body scan meditations may vary, they have several basic elements in common. These relate to being grounded bodily and mentally, noticing your breathing and paying attention to your body and its sensations. Being grounded bodily – often this is achieved by paying attention to your posture, ensuring you are comfortable and relaxed, and upright if seated in a chair. There may be many times when you are unaware of your posture which can be a form of slouch, whether you are sitting or standing. Focusing on becoming grounded bodily, can help rectify this tendency to slouch throughout the day. Being grounded mentally – this basically involves bringing your full attention to the process of a body scan and your specific intention in undertaking it. Noticing your breathing – this can be a simple act of being aware of your breath and its characteristics (such as slow or fast, deep or shallow), without any effort to control your breathing. It can also be a more conscious approach where you take a couple of deep breaths to aid the process of relaxation and being grounded in the present. A deeper breathing approach is lower-belly breathing which can be incorporated into your body scan. Paying attention to the pressure on your body – this initial approach to increasing bodily awareness, involves noticing the pressure from the floor or your chair on your body at different points, e.g. on your back, feet, buttocks, shoulders. This is a form of conscious grounding – noticing the impact of your immediate physical environment on your body. Paying attention to your bodily sensations – this is the core activity in a body scan, the other activities serves as a warm-up or preparatory exercise. Here you are exploring your body, looking for any points of tightness, tension, pain or contraction. The aim is to progressively release or soften these points to free your body from its stress response. Developing your awareness about these points of tension, can help you to more quickly become aware of a negative emotional reaction to a stressful situation. Paying attention to your feelings – becoming aware of your bodily sensations can give you insight into how you are feeling about a situation or interaction. Often, we hide negative emotions, which further exacerbates the tension in our bodies. If you can get in touch with your negative feelings through a body scan, you can name these feelings and, over time, successfully control them. This last step represents the deepest approach to body scan meditation and the most time consuming method, as you need to undertake the precursor activities to get in touch with your bodily sensations and be in an open frame of mind to name those feelings. As we grow in mindfulness through the different forms of body scan meditation, we increase our capacity to focus, enhance our self-awarenesss, develop our relaxation response, improve our self-regulation and increase our capacity to be in the moment. Sometimes we can become consumed by anger and be captured by the thoughts, emotions and bodily sensations that accompany anger. Meditation provides a way to let go of anger and its associated ill-effects. The catalyst for your anger may be that someone did or said something that you considered unfair. It may be that what was said or done frustrated your ability to meet your goal of helping other people to achieve something important. You could feel aggrieved that the thought, effort and cost that you incurred for someone were unappreciated and/or devalued. It could be that comments made by someone else are patently untrue or distort the real picture of your involvement. The problem with anger is that it is such a strong emotion, that we tend to hang onto it – we do not let it go. We might ruminate endlessly on what happened, providing justifications for ourselves – our words and actions. We could deflect the implied criticism by denigrating the other person’s intellectual capability or perceptual capacity. We could make assumptions about their motivation and even indulge in conspiracy theory. An associated problem with indulging in angry thoughts and sensations is that it harms both us and our relationships. We are harmed because the negative emotions consume mental and emotional energy, distract us from the present moment (and all that is good about the present) and destroy our equanimity. Indulged anger can lead to retaliation that harms the relationship with the other person. It can also contaminate our relationships with other people who are important to us such as our partner, a friend or our children. As a result of our sustained anger, we may appear aloof, critical, grumpy or unsympathetic to these important people in our life. 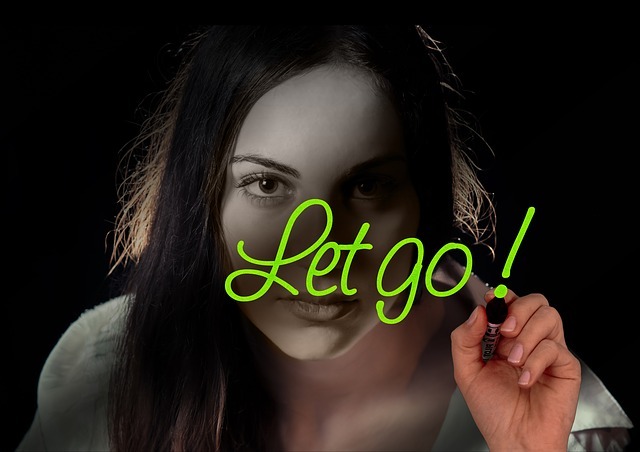 Diana Winston offers a meditation podcast on letting go. She emphasises the fact that when we indulge a strong emotion like anger, the bodily manifestation of this can be experienced as tightness, tension or soreness – a physical expression of holding on. We can even experience shallowness of breath as we hold the negative emotions in our bodies. The first level of release through meditation is to focus on your breath – the in-breath and out-breath. This mindful breathing can be viewed as letting go with each out-breath, releasing the pent-up thoughts and emotions that make you uptight. As you progress your meditation and begin to restore some semblance of relaxation, you can then address the “holding on” in your body. Through a progressive body scan, you can identify the parts of your body that are giving expression to your anger – you can physically soften the muscles (facial, back, shoulder, neck or leg muscles) that have become hardened through holding onto your anger. Once you have become experienced in meditation, you can then begin to reflect on your response to the negative trigger that set you off. This opens the way to look at how you responded and whether there was an alternative way of responding other than defensiveness or attack (flight or fight). You might discover (as I did recently) that active listening would have achieved a better outcome, an improved level of mutual understanding and reduced stress generated by angry thoughts and emotions. Taking this further, you could explore a powerful mindfulness meditation that can help you overcome ongoing resentment by enabling you to put yourself in the position of the other person to appreciate how they experienced your interaction – to understand their perspective, their feelings and their needs in terms of maintaining their identity (their sense of self-worth, competence or reliability). The Search Inside Yourself Leadership Institute (SIYLI) recommends this meditation practice for handling residual emotions and resentment resulting from a conflictual interaction. As we grow in mindfulness through meditation and reflection we can practise letting go of anger and other negative emotions by focusing on our breath, bodily sensations, emotions, thoughts and behaviour in an interaction. Through the resultant self-awareness, we can improve our response ability. By exploring the interaction experience from the position of the other person, we can also increase our motivation and our options to behave differently for our own good and that of the person with whom we have interacted. Restlessness during meditation is experienced by everyone, even the advanced meditator. It is important to be with the moment and be non-judgmental with ourselves, avoiding the temptation to “beat up on ourselves”. So, part of dealing with restlessness during meditation is accepting what is and what is happening to us without self-censure. Paying attention to our present moment experiences with openness and curiosity and a willingness to be with what is. Diana in a meditation podcast on restlessness as an obstacle to meditation offers four strategies to deal with this restlessness which can be experienced in our mind and manifested in our body in the form of tightness/tension or the need to keep changing our posture. These strategies require a consciousness about what is happening in our mind and/or body during meditation and a willingness “to be with what is”. Narrowed focused – you can narrow your focus so that you are concentrating even more closely on your breath. You can observe the beginning (in-breath), the middle (space between in-breath and out-breath) and the ending (out-breath). 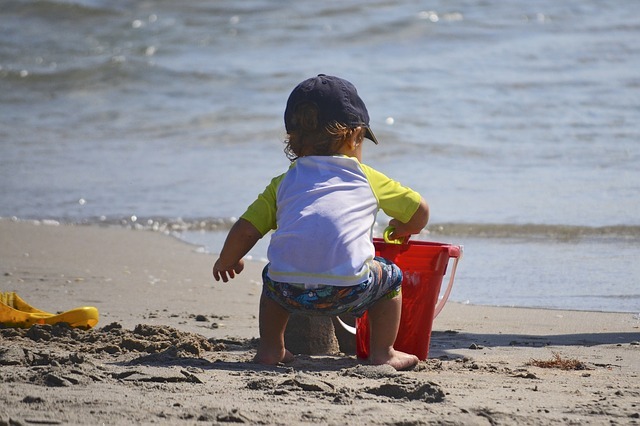 You could narrow your focus like the child in the image above who is totally absorbed in their play with a bucket at the beach. This response to restlessness entails stillness combined with a narrowed focus. Widened focus – an alternative to narrowing your focus during meditation is to do the opposite, widen the focus of your attention. One thing that you could focus on is the sounds that you hear, bringing your attention to listening. Your focus could shift from the sounds that are nearby to those that are the furthest away. Widening your focus entails changing your attention away from the mind’s relentless activity to what is happening aurally in the present moment. Focus on the restlessness – you can focus on the restlessness itself. This involves paying attention to what is going on in your mind and your body. You could name the mental restlessness by saying something like, “There you are again Mr. Restless drawing my attention away”. You could then get in touch with your body to feel the impact of the restless mind and to notice “how” and “where”the restlessness is being experienced in your body. Change of posture – this involves a slight change of posture to re-focus your mind. You may find, for example, that your shoulders have slumped slightly, so you could straighten them. You may have crossed your feet and no longer have the soles of your feet on the ground. Correcting your posture can bring you back to the present moment and what is the purpose of your meditation. As we grow in mindfulness through the regular practice of meditation, we can more easily adopt strategies to deal with restlessness during meditation. Persistence with meditation practice brings its own rewards.